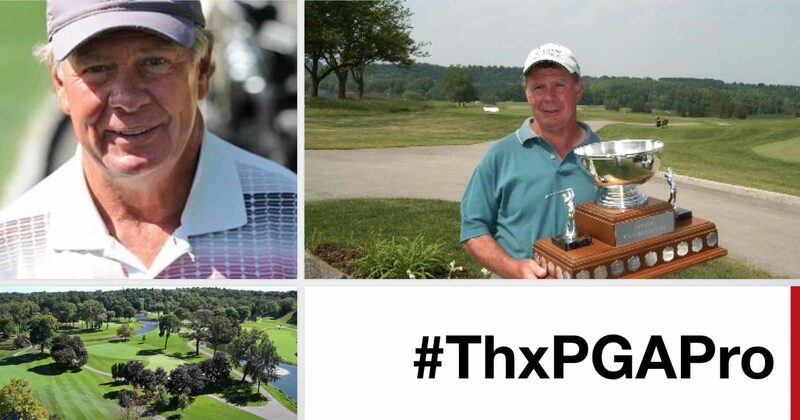 I’m very sad to learn that Canadian PGA Professional, Jerry Anderson, who was a fixture around my home club of Credit Valley in Mississauga, Ontario, Canada, passed away at the age of 62. A slide from my 2016 keynote for the PGA of America – in which I paid tribute to the impact Jerry had on my game. See my video clip below. I spoke about Jerry Anderson in my opening keynote at the 2016 PGA Merchandise Show in Orlando; the theme that year was that we should recognize and give thanks to the PGA Professionals who had an impact on my our golfing life. Jerry certainly had an impact on mine; he had the remarkable patience to try to teach me over 3 seasons. Jerry was a fixture around our club in so many remarkable ways. He was a PGA teaching professional; a regular participant in Mens Day, where he would go and shoot the lights out with an incredible short game; and in the latter years, a regular fixture on the lawn cutting equipment, constantly watching me duff my shots into the river! And when you would pull up to the bag drop, there he was, as started, getting your bags and schlepping them to the start. I always felt bad to have a guy who was a European tour pro take my bags like that, but he would insist. A remarkable man, and the golfing world will miss him. In January, I was delighted to be the opening keynote speaker for the 2016 PGA Merchandise Show in Orlando, one of the largest trade shows in the world. After my keynote, I led a panel discussion with some of the companies that are having a major impact on growing the game through innovative technology. One of my panelists was Andrew Macualay, the CIO of TopGolf, one of the most innovative and fastest growing sports facilities in North America. Given that there is a video of their new Las Vegas facility circulating around the Internet (and which is gaining quite a bit of attention), I thought I’d run a clip from our discussion on stage. It’s pretty insightful in terms of the impact of TopGolf on potential growth of the game. Here’s the Las Vegas TopGolf clip filmed by Golf Digest. Topgolf Las Vegas is insane! It has 108 hitting bays, five bars, four floors, two swimming pools, a Callaway fitting center and more. Watch our Snapchat story (golfdigestmag) to check it all out! It opens to the public on May 19th ???????? Is TopGolf on the right track? Drawing in millennial? Watch this! I just wrote an article for the PGA of Canada, around the issue of new technologies coming into the game. Enjoy! 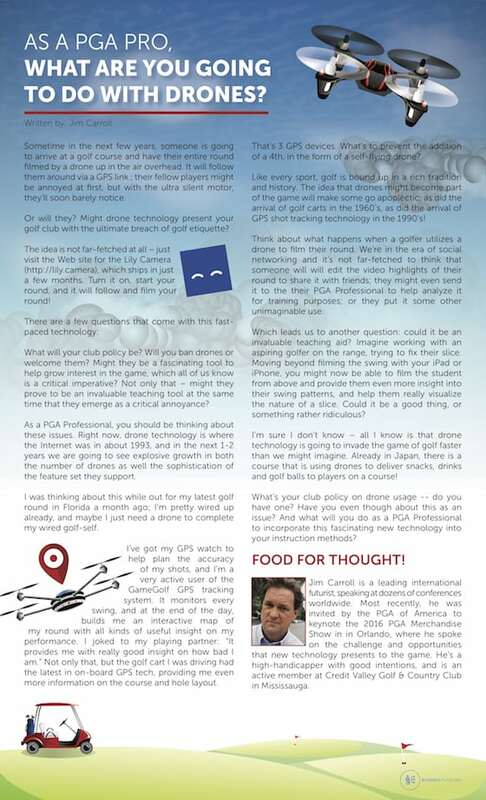 You can access the full PDF of the article As a PGA Pro, What Are You Going to Do with Drones? Sometime in the next few years, someone is going to arrive at a golf course and have their entire round filmed by a drone up in the air overhead. It will follow them around via a GPS link ; their fellow players might be annoyed at first, but with the ultra silent motor, they’ll soon barely notice. Or will they? Might drone technology present your golf club with the ultimate breach of golf etiquette? The idea is not far-fetched at all. Turn on your drone, start your round, and it will follow and film your round! What will your club policy be? Will you ban drones or welcome them? Might they be a fascinating tool to help grow interest in the game, which all of us know is a critical imperative? Not only that – might they prove to be an invaluable teaching tool at the same time that they emerge as a critical annoyance? As a PGA Professional, you should be thinking about these issues. Right now, drone technology is where the Internet was in about 1993, and in the next 1-2 years we are going to see explosive growth in both the number of drones as well the sophistication of the feature set they support. I was thinking about this while out for my latest golf round in Florida a month ago; I’m pretty wired up already, and maybe I just need a drone to complete my wired golf-self. I’ve got my GPS watch to help plan the accuracy of my shots, and I’m a very active user of the GameGolf GPS tracking system. It monitors every swing, and at the end of the day, builds me an interactive map of my round with all kinds of useful insight on my performance. I joked to my playing partner: “It provides me with really good insight on how bad I am.” Not only that, but the golf cart I was driving had the latest in on-board GPS tech, providing me even more information on the course and hole layout. That’s 3 GPS devices. What’s to prevent the addition of a 4th, in the form of a self- flying drone? Like every sport, golf is bound up in a rich tradition and history. 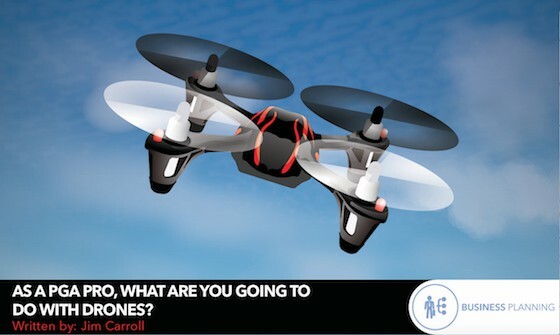 The idea that drones might become part of the game will make some go apoplectic; as did the arrival of golf carts in the 1960’s, as did the arrival of GPS shot tracking technology in the 1990’s! Think about what happens when a golfer utilizes a drone to lm their round. We’re in the era of social networking and it’s not far-fetched to think that someone will will edit the video highlights of their round to share it with friends; they might even send it to the their PGA Professional to help analyze it for training purposes; or they put it some other unimaginable use. Which leads us to another question: could it be an invaluable teaching aid? Imagine working with an aspiring golfer on the range, trying to fix their slice. Moving beyond filming the swing with your iPad or iPhone, you might now be able to film the student from above and provide them even more insight into their swing patterns, and help them really visualize the nature of a slice. Could it be a good thing, or something rather ridiculous? I’m sure I don’t know – all I know is that drone technology is going to invade the game of golf faster than we might imagine. Already in Japan, there is a course that is using drones to deliver snacks, drinks and golf balls to players on a course! What’s your club policy on drone usage — do you have one? Have you even though about this as an issue? And what will you do as a PGA Professional to incorporate this fascinating new technology into your instruction methods? Jim Carroll is a leading international futurist, speaking at dozens of conferences worldwide. Most recently, he was invited by the PGA of America to keynote the 2016 PGA Merchandise Show in in Orlando, where he spoke on the challenge and opportunities that new technology presents to the game. He’s a high-handicapper with good intentions, and is an active member at Credit Valley Golf & Country Club in Mississauga. More food for thought! Here I am at the 2016 PGA Merchandise Show, speaking about the issue! Trend: Golf, Technology, and Growing the Game: My Most Recent Keynote for the PGA! The PGA of America invited me in again to headline their main stage, to talk about how various emerging technologies will provide opportunities to grow the game. I was delighted to share the same stage as Bubba Watson, Lee Trevino and Hank Haney among others! Here’s the entire video, running about 35 minutes in length. If you love the game, you might find it to be a worthwhile watch!